Two edges were started today on Randje per week challenge. I could use the blue shaded thread after many weeks. The link for the free graph is here. Last week they had mentioned that this challenge will run next year also. This post is about the projects done in this week. SharonB started this idea of sharing the work in progress on her blog. This post helps me to work consistently on the projects and challenges. To see others progress visit Pintangle. These two edges were completed this week. I worked on them on my return journey from Dubai. The sun was so bright facilitating the work. Progress on tussar tunic is minimal. 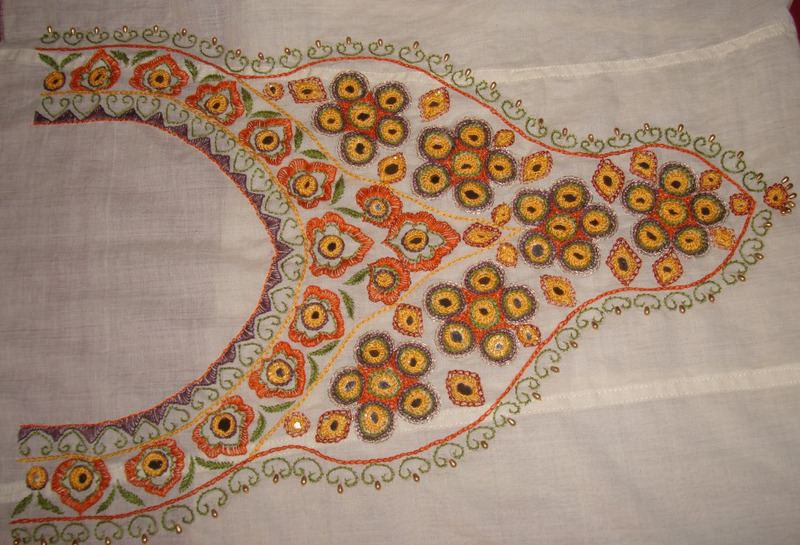 A border pattern was drawn for the sleeves which combines traditional Indian design and mirrors. Seems like this project could take some time. Started herringbone filling stitches with fine silk thread. When going through a pattern book, I saw a greek border pattern. 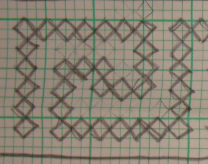 This led to drawing kutchwork squares on this pattern. I am trying to squeeze this small project this week. Between the Dubai trip during the weekend, and these two projects, the beaded barb stitch is yet to be ventured. We had another stitch yesterday. Today I started these two edges on Randje per week challenge. The free graph is here. Listing and writing about the projects which are in progress is a support group started by SharonB. To see others progress visit Pintangle. These two edges were completed this week on Randje per week challenge. These took more time than usual. I completed attaching mirrors on the cream ethnic tunic. Small oval gold beads were also added the outline stem stitch pattern. This tunic is completed and ready to go to the tailor. I drew a pattern for embroidery for another tunic. The tunic is yellow and gray tussar silk with stripes. The sleeves of this tunic will have embroidered border in black fabric with mirrors [yeah, Again]. My mirrors want to serve higher purpose instead of being stored in small cardboard boxes. I took longer time than I expected to complete last week’s TAST sampler. I need to start beaded barb stitch samples. Some more samples of barb stitch. 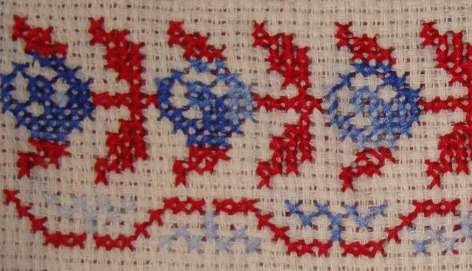 This stitch was worked as tree motif in the first sample. The buttonhole stitches were worked in a pattern to achieve this. The second sample can be worked as a broad border and a filling. 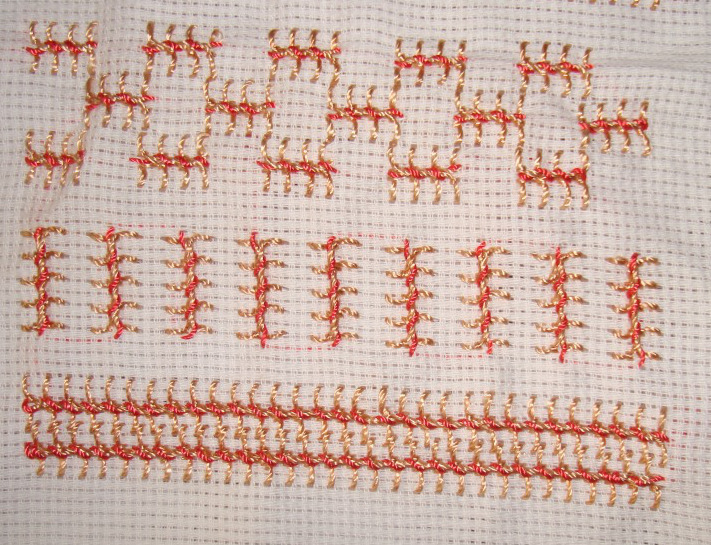 Every fifth whipping stitch is dropped in the third sample. 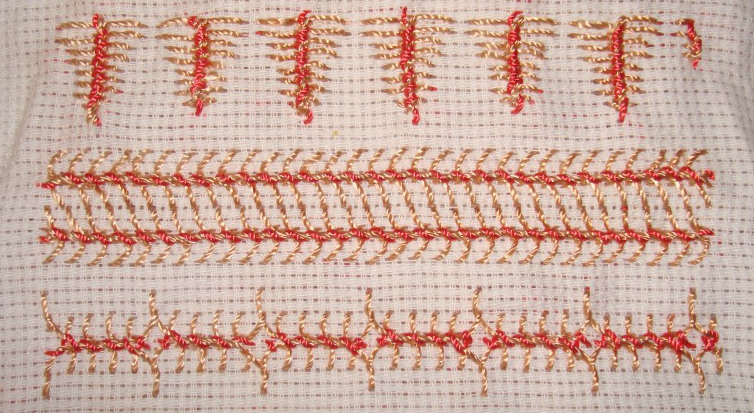 These samples are barb stitch on buttonhole stitch variations-1. Up and down buttonhole rows. 2. Closed and crossed buttonhole rows.3. Top knotted buttonhole rows. The first sample is combined with double lock stitch, this sample looks like lace when worked with polyester thread. The barb stitch is combined with knotted buttonhole band in the last sample. The sampler was completed today. This week’s TAST stitch is an easy one. 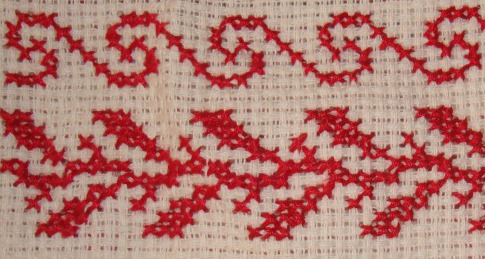 The tutorial for the stitch is on SharonB ‘s blog. With the idea of exploring this as linear and filling stitch I started this sampler. In the second sample the buttonhole rows are worked apart, when the whipping stitch was pulled tight, it looks like the first sample. 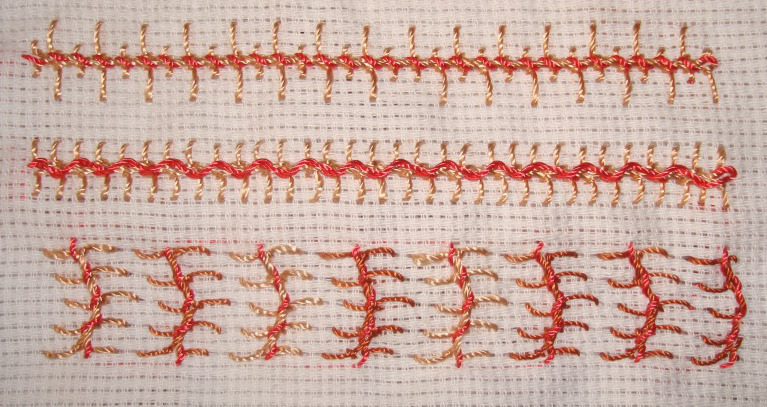 Variations of this stitch as filling stitch. In the first sample, the whipping is done on long and short buttonhole rows. Alternate spaces are whipped twice in the second sample. Another filling idea is tried in the third sample.